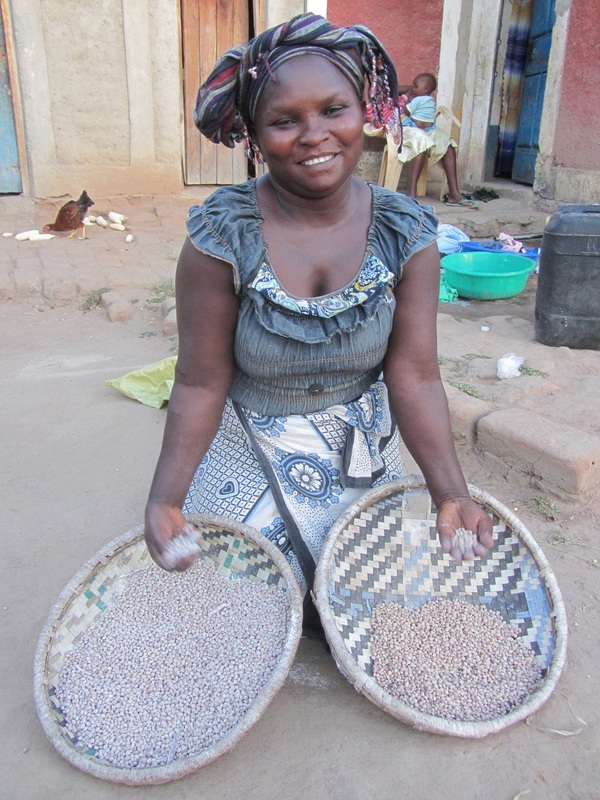 Cowpea is an important food crop in Africa. It is grown by most small-holder farmers in Machakos and Makueni Counties in Kenya. Cowpea is generally regarded as being tolerant of poor soil fertility. As a result, farmers do not apply manure or fertilizer to the crop. However, as soils have become depleted of their natural fertility, grain yields have declined. As most soils are deficient in Phosphorus (P), FIPS-Africa has been encouraging farmers to experiment with dressing their seeds with P.
Farmers are finding that the addition of only 25 g of a product to 1 kg of seed can more than double their grain yields. This farmer, near Kasikeu in Makueni County, shows her harvest from a small plot experiment using a P seed dressing on the improved M66 variety. In her left hand is the harvest from the plot without seed dressing. This weighed only 0.5 kg. In her right hand is the harvest from the seeds which had been treated with P. This weighed 1.4 kg. Despite extremely low rainfall during the long rainy season, P seed dressing increased grain yield by 280%! This farmer is just one of hundreds of thousands of small-holder farmers in East Africa currently benefiting from FIPS-Africa’s Approach. The Approach is helping farmers to quickly and cost-effectively improve their crop productivity and incomes through the adoption of improved crop varieties and improved crop and soil management. 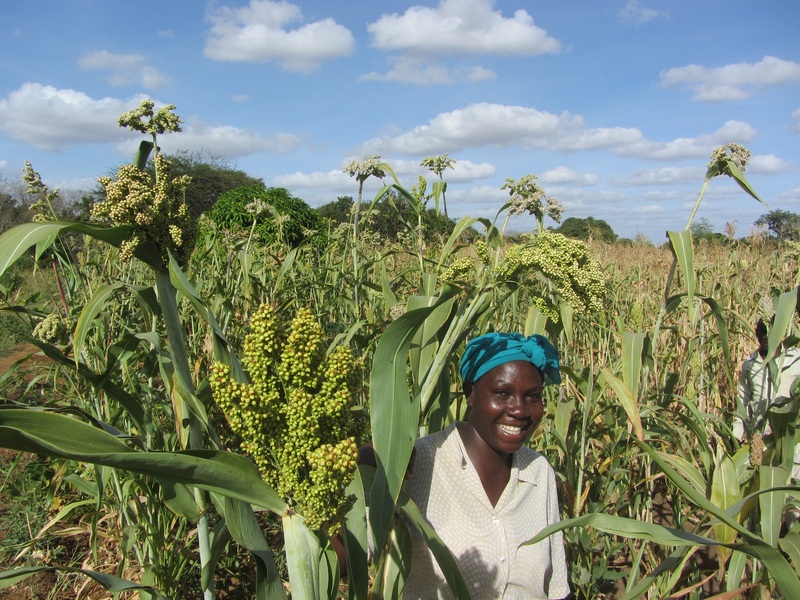 Can the traditional “Kavila Cha Iviu” sorghum variety make a comeback in Makueni County? The “Kavila Cha Iviu” sorghum variety used to be grown by most small-holder farmers in Makueni County in Kenya. It is drought-tolerant and is fairly resistant to attack by birds. Following a series of crop failure in consecutive seasons due to drought, many farmers lost their seeds, and switched to planting maize when it was distributed as relief food. However, maize is not well-adapted to the low and poorly-distributed rainfall in the County, and farmers frequently experience crop failure. There have been many initiatives to promote improved high-yielding, dwarf, white-grained sorghum varieties such as “Gadam”, but these are loved by and attacked by birds, resulting in low yields. Therefore, FIPS-Africa has started to distribute small (50 g) seed packs of the traditional “Kavila Cha Iviu” variety to encourage farmers to grow the variety again. In the current 2016/7 long rainy season in Makueni County, rainfall started late and ended early. Most maize crops have failed, but farmers with the “Kavila Cha Iviu” variety are expecting to harvest grain. They say they will increase the area planted to the variety next season. This work complements FIPS-Africa’s campaign to vaccinate chickens against the Newcastle disease. The sorghum can be fed to chickens which can be sold to purchase maize grain, which farmers now prefer to eat. http://fipsafrica.org/wp-content/uploads/2017/01/logo-2.png 0 0 admin http://fipsafrica.org/wp-content/uploads/2017/01/logo-2.png admin2017-02-13 20:40:212017-02-13 20:40:21Can the traditional “Kavila Cha Iviu” sorghum variety make a comeback in Makueni County?